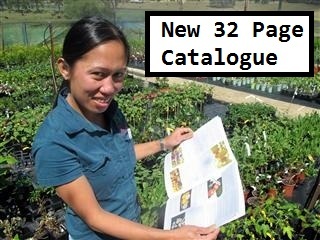 One of our Staff Josie ( on the right with our Catalogue ) has had lots of experience with hot food and I was told 'through the grape vine' that she often took the Chilli off the plants in our nursery and ate them. Now I had a high opinion of my ability to eat hot foods and so I saw one of the Habanero Orange Chillis that looked amazing and the bright colours of the chillis on such a small plant lured me in. So I said to myself. "... I am great with hot food after all I choose "HOT" when I eat at Nandos"
I took an innocent little bite perhaps like Adam and Eve and oh boy was I under gunned for this experience. It can be compared to eating tablespoons of wasabi. My head felt like it exploded and water did nothing. My Chilli experience had not finished. About 30 minutes later I finally got my composure but needed to go to the toilet after drinking so much water. I had those board shorts on that require you to undo the knot. As I did so my hands touched my stomach and instantly I had huge red marks. It felt like I had been kicked in the guts. It took 2 days for the marks to go away. "...Always be sure to wash hands after use..."
"... Rates 10 out of 10 on the heat scale....."
Share your Chilli Experience below or on our Daleys Fruit Tree Facebook Page or Daleys Fruit Tree Google+ Page.